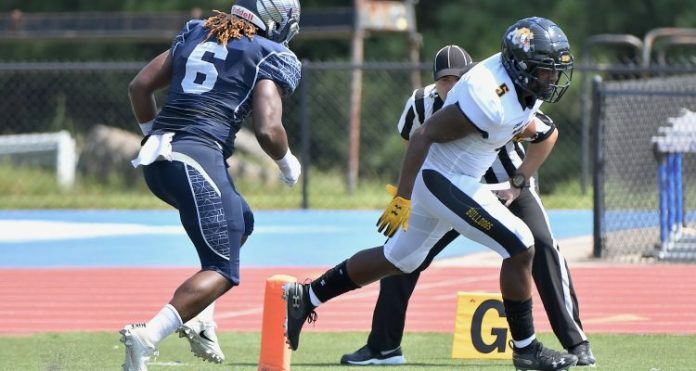 RALEIGH, N.C. – Bowie State University (3-1 / 1-0 CIAA) began conference play on Saturday (9/22) and defeated Saint Augustine’s University (0-3 / 0-1 CIAA) in the George Williams Sports Complex by a final score of 32-22. This was the fourth straight week on the road for Bowie State’s Bulldogs and the home opener for Saint Augustine’s Falcons. Senior Amir Hall had another outstanding game, throwing for 354 yards, completing 28-of-42 passes and three touchdowns to lead the Bowie State offense. The Bulldogs combo of redshirt senior Gilbert Lunsford (Upper Marlboro, Md.) and redshirt sophomore Montez Clay (Baltimore, Md.) paced all receivers with 125 and 95 reception yards respectively. Redshirt junior Brandon Abrams and senior Maurice Williams, both of Baltimore (Md.) were Bowie State’s leading ground gainers with 33 and 22 yards respectively. Senior Roger Richardson (Glenn Dale, Md.) led Bowie State’s defense with seven tackles while junior Oluwaleke Ajenifuja (Beltsville, Md.) added five tackles, which included 1.5 sacks, two tackles for a loss and one fumble recovery in the contest. Bowie State took the opening drive 87 yards, and Hall connected with Abrams for a 15-yard touchdown pass at 12:06 of the first quarter but the two-point conversion was no good. Saint Augustine’s Lenwood Joyner hauled in a 45-yard pass from John Darby, IV to put the first six on the scoreboard for the Falcons. The Sean Smith extra point was good to give the Falcons the 7-6 lead at the 8:28 mark. Bowie State regained the lead at the 12:45 mark of the second quarter on a Hall to Lunsford 48-yard touchdown pass and the two-point conversion was good to set the score at 14-7. Junior William Flowers (Baltimore, Md.) returned a punt 50 yards for the touchdown with 10:58 left in the second quarter to push the Bulldogs lead to 20-7. The Bulldogs extended its lead to 26-7 when Hall tossed a 21-yard pass to Clay with 3:09 to go in the 2nd quarter. Bowie State capitalizes on a Saint Augustine’s miscue early in the third quarter. Brandon Abrams rumbles in for a 17-yard touchdown to push Bulldogs lead to 32-7 at 12:38 of the 3rd quarter. Saint Augustine’s Jeremiah Miller punched it in from 1-yard out to set the score at 32-14 with 3:26 remaining in the game. Miller lead both teams in rushing with 92 yards on 23 carries. Darby scored on a 9-yard keeper to narrow Saint Augustine’s deficit to 32-22 with 2:42 left in the game. Darby finished the afternoon with 82 passing yards, completing 8-of-16 but was sacked five times. Bowie State University will make its first appearance at home this season when the Bulldogs host the Rams of Winston-Salem State University next Saturday (10/29) at 4 p.m.